Add varying amounts of a chemical to a beaker of water to create a solution, observe that the chemical dissolves in the water at first, and then measure the concentration of the solution at the saturation point. Either potassium nitrate or sodium chloride can be added to the water, and the temperature of the water can be adjusted. How does temperature affect a solute? Students are divided into two groups to facilitate completing Activity B (Exploration Guide). Solubility ... (more)curves of the two salts are compared. 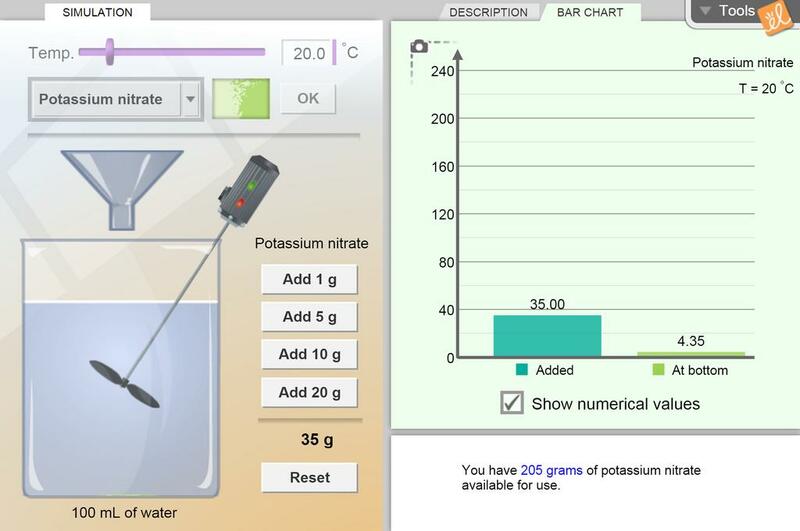 Great Gizmo to explore solutes and temperature - created experiment that uses it. Great way to introduce the effect of temperature on solubility! superb guidance into vocabulary requuired to teach solutions and solubility.